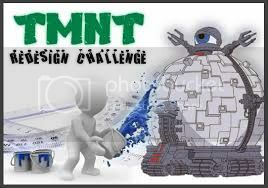 Hey guys I think its time to revive the Technodrome Redesign Challenges. And then you will have until April April 20th to submit a design and then vote for a winner. All people who choose to participate will have until the end date to come up with a redesign for the given character. You can use any medium you wish. You can sketch, paint, make a 3-D model, make a sprite, make a custom action figure, whatever you want. Its entirely up to you! You can post any number of redesigns you want and chose if it will be submitted to the contest poll, but when nothing is mentioned by the submitter, they will be always considered submissions. Will only be considered a maximum of 2 finished Art submissions per participant for the contest poll. All submissions made after the end date will not be considered, so please don´t post more art if the deadline ended. As well, you don't have to force yourself to make your design conform to any new or old cartoon or comic book's style. Be as drastic in your redesign as you see fit. Whatever makes you happy. If you can't think of a new design, or just hate the idea of working on this character, you do not have to feel obligated to participate in this particular challenge. You will still be free to participate in any future challenges you wish. Anyone may compete make submission and anyone can vote even if they decide not to participate. Also note if Bebop and Rocksteady are chosen a submission may be made with only one or both characters or two separate submission, one with each. Last edited by Redeemer; 03-27-2015 at 07:52 PM. Only a few day left guys make sure you vote!!! Last day folks, lets brake this tie!!!! I would like to see some Caseys! Ok guys sense it was a Tie I let D Osborn (Previous winner) choose between the two and he chose Neutrinos I will be adjusting the submission date due to my slacking.